Teleworking. It sounds like a wonderful solution doesn’t it. Certainly it saves a lot of time commuting and fighting the traffic. And there is the lure of more flexibility in finding time to be with the family. It should be a win/win – less stress, more efficiency, higher quality of work, better balance of life. There has been a lot of talk about it. Stéphane Valeri when he was Minister of Health and Social Affairs, was a proponent for its advantages. It took a while for the Conseil National to pass a law on it but in 2016 it made it into the law books. This has helped in smoothing the path for French workers. But, as yet, the four thousand or so Italian residents who work in Monaco need Italy and Monaco to agree exactly how to cover them by law. HelloMonaco is eager to know – to what extent is teleworking taking over, in reality. And what are the results. The press reports show between 50 and 60 companies operating in the Principality are taking advantage of the opportunity to involve, up to now, just under 600 employees in total. It is generally the big enterprises where these lucky people spend about one day of the week at home – and of course computers, laptops, iPads and mobile telephones make it all possible. This is not exactly a revolution in the Insurance, Banking, Telecoms and Oil industries involved. But so far it seems to be the cautious model that is winning – and by which companies mainly get admin work done. 600 employees working one day a week at home is not going to take huge pressure off the commuting traffic into Monaco, but it’s great for the ones involved. Nor, so far, does it seem to be a great job creator. The essence of the reporting on the subject is that it is existing employees that have been given this opportunity – perhaps to assure management that it really works before extending the practice. But there is a sign that the Government might get involved in the public sector. And that might involve creating shared office space outside the Principality to avoid commutes and to benefit the environment. So teleworking doesn’t necessarily mean working at home. It requires a lot of thought so as to not disrupt the face to face contact that the public needs when using public services. And key is how to protect the confidentiality of all the data employees access and use while doing their jobs. HelloMonaco discussed with management consultants in Nice and Paris the press reports showing the high but differing degrees of employee satisfaction and manager satisfaction from company surveys. Employees greatly enjoy the flexibility. Managers agree it is working but still worry about the looser supervision. Management consultants advise on having clear objectives and goals, that everyone has bought into, in terms of work – then you need worry less about lack of direct supervision. And ensuring that the right digital support and tools are in place is paramount – it is vital to have efficient and rapid access to information and Apps that work fast with the info. 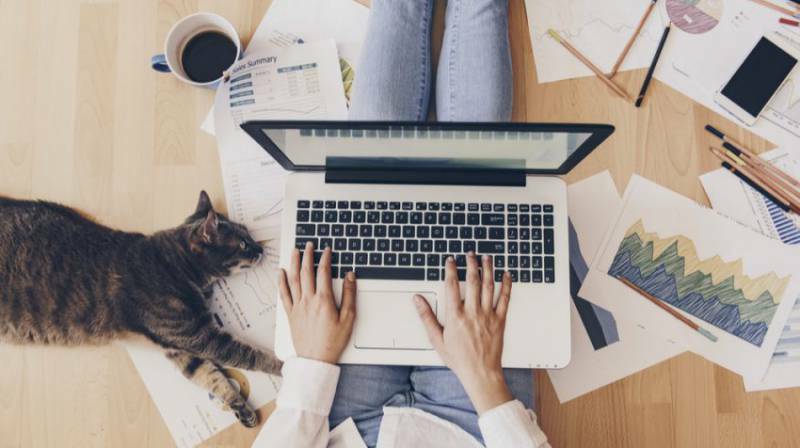 Then there is the question of how much of the week is spent teleworking – one or two flexible days is one thing – more than that is a whole different kettle of fish with respect to social and professional contact with colleagues. And career-wise there is a danger of “out of sight, out of mind”.